On Friday morning I headed south to the Chiltern hills.There were two reasons for this the first was that I was getting fed up at not been able to point the camera at any decent birds since the Napton Spotted Flycatchers and the Chilterns are the best place to see Red Kites one of my favourite birds.The second reason was I needed to go on a decent run in my new car to learn how to handle it.In order that I could get to see any rarities that might show much quicker I'd gone for a Porcshe Carrera S.
If you believe that you will believe anything.People who know me know that I wouldn't be able to drive one of those down the drive let alone on a road.No the BMW 3 series that I'd had for 8 years was replaced with an Audi A1 mainly for it's better fuel consumption. I am hopeless from going from one car to another so I needed this trip to the Chilterns especially as the A1 has 6 gears (I struggle with 5),an on board computer to distract me,all the controls in different places and a Stop/Start fuction that I didn't understand.Another thing I discovered that everyone else seemed to know was that most new cars do not come with a spare wheel. I headed to Watlington which I reckon is the best spot to get shots of the Kites.You don't need to leave the car park as the Kites zoom over all the time but needing to stretch my legs I walked round the village.I needed to get some Kite shots with them roosting and it wasn't long before I spotted some in the trees in people's back gardens.Wouldn't that be fantastic to look out into your back garden and see a couple of Red Kites in one of your trees. Quite pleased with these shots as I had to take them at distance from the footpath along the road through gaps between the houses into their back gardens. I ended up at the Carriers Arms a pub that is only 50m from the car park which has an excellent garden and has open countryside on two sides.I bet there are not many pubs in the country where you can drink all day,eat all day and have Red Kites zooming over your head calling out.Magic!!!!. I didn't need any flight shots as I already got quite a few which was a good job because this time I messed up loads of shots that day most of them being very dark silhouettes. Struggling to get any shots. I'm struggling to get any decent shots locally mainly because it is so quiet at all our local patches at the moment.My bird text alert service set to the West Midlands and Warwickshire has not gone off for 10 days. 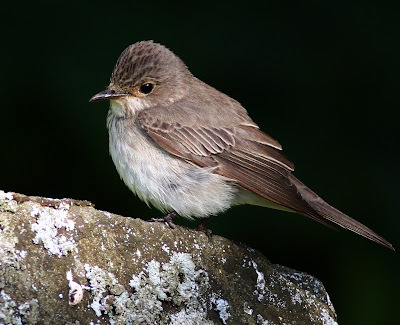 Visited Berkswell churchyard again on Tuesday morning and soon found some Spotted Flycatchers.Since the chicks have fledged they prefer the trees and do not visit the gravestones much now so it's hard to get any decent shots.Did get some ok shots but if I post any more SF shots Google might close down my blog. Paid a quick visit to Marsh Lane on Thursday lunchtime and as expected it was very quiet.Did manage some shots of a young Reed Warbler and a young Reed Bunting but that was all. 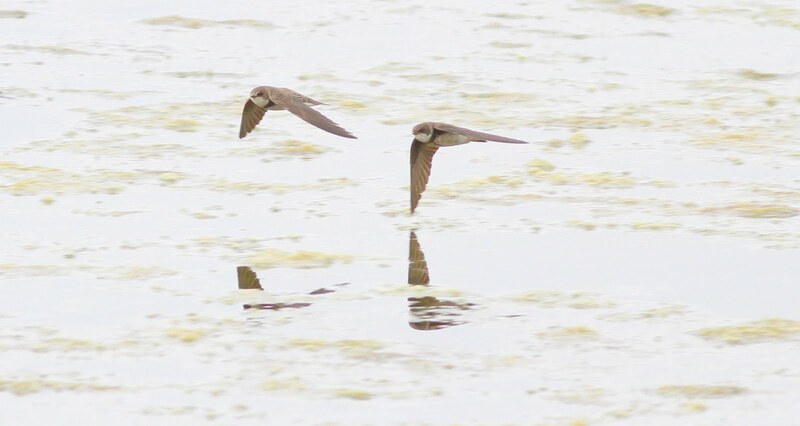 Not wanting to go home yet I decided to do a pretty stupid thing and try and get some flight shots of the Sand Martins that were whizzing around near the car park hide.What a game that is !!!! 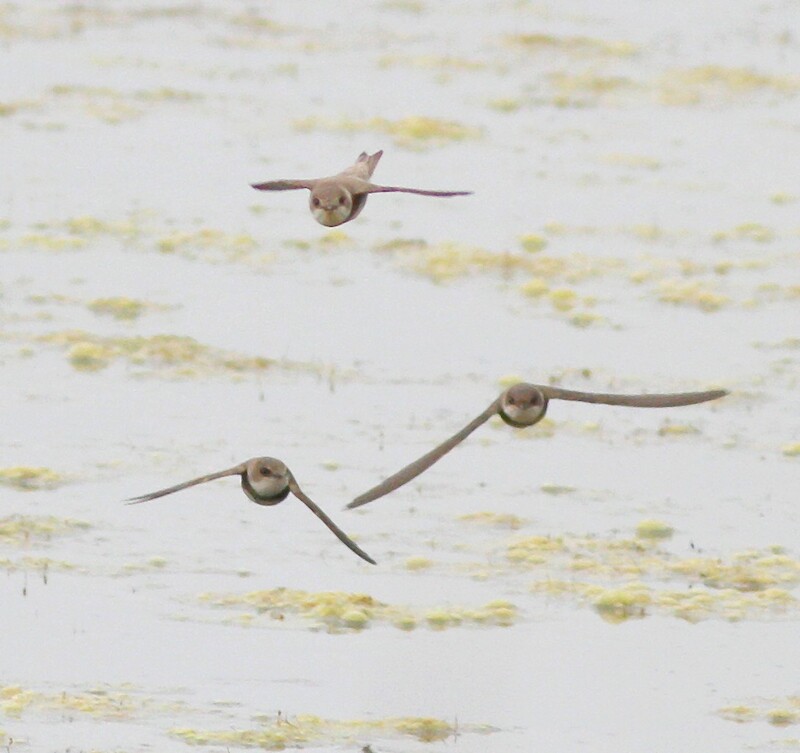 Far too fast for me so I ended up with loads of blurred brown blob shots.Here are a few that are just recognisable as Sand Martins. A tour of local patches. 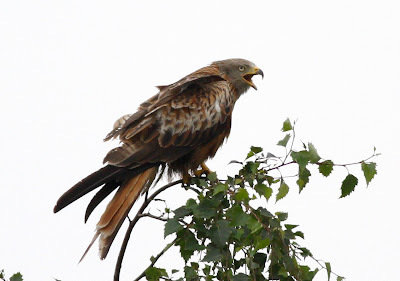 As soon as I'd got over the shock of waking up to a sunny and warm morning on Thursday I made plans to do a tour of some local patches feeling sure I would be able to find some decent birds to point the camera at. The plan was to go over to Brandon Marsh first mainly because I hadn't been there for quite a while now and even if there were no birds to see I could have a chat to the pretty waitress.I would then head to Berkswell where I hoped to find the Spotted Flycatchers again and then I would head down the road to Marsh Lane to see if the very shy Black-necked Grebes had become brave and were a bit nearer to the hide. Started walking round Brandon not long after 9.00AM and although two hours later I'd not used the camera once it had been very enjoyable walking round in the warm sunshine for a change.There was only one birder in the Carlton hide when I arrived there and he was very grumpy not having seen anything all morning.He was even more delighted than me when a Kingfisher turned up for a short visit.This KF was the first I'd seen from the Carlton hide for many months. 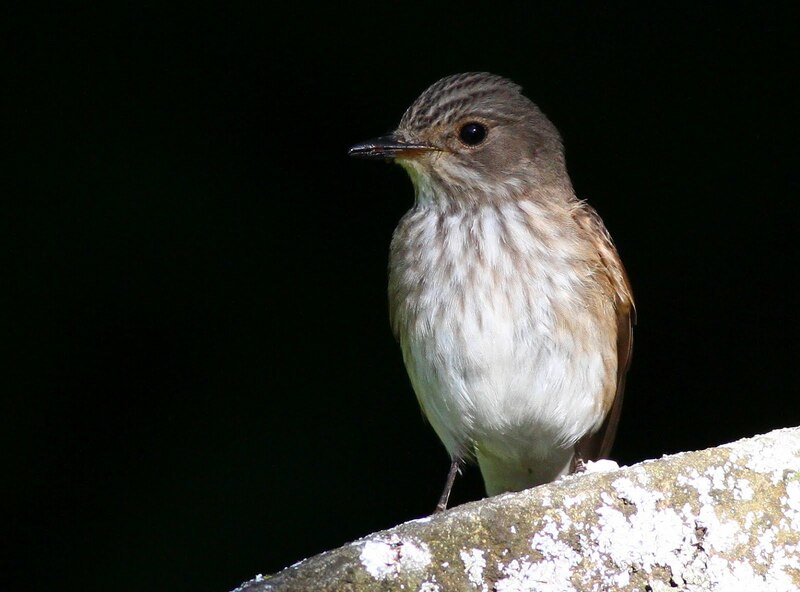 I then headed off to Berkswell and entered the churchyard not long after 1.00PM.I soon found the Spotted Flycatchers but they were spending all the time in the trees. After half an hour when the SF's had not made a single visit to where I reckoned the nest was and were remaining in the trees I realised the reason why.The chicks had fledged!!!!! Once my slow brain had taken this on board I began to pick up the chicks calling out deep in the trees and set out to try for a shot or two.This was not easy to say the least but I was lucky to get a clear shot of one. I then went down the road to Marsh Lane to have another go at the BNG's but when I entered the hide I was told the they had flown.Bugger!!!!! They had been there for 10 days and I'd not got one decent shot. 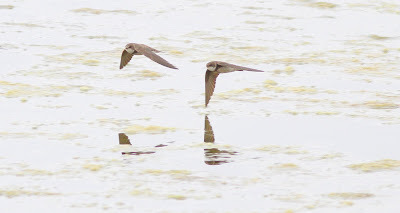 The only other moment of interest was when a Hobby flew along the car park pool but instead of staying for a while it immediately disappeared out of site over Sidden wood. Taking advantage Tuesday lunchtime of a gap between the showers I made a visit to Marsh Lane.Like a fool I was having yet again a go at getting a decent shot of the Black-necked Grebes that had been present on the car park pool for over a week now but had not once come anywhere near the hide (Well not for me). Did I have any luck this time? No way !!!!! 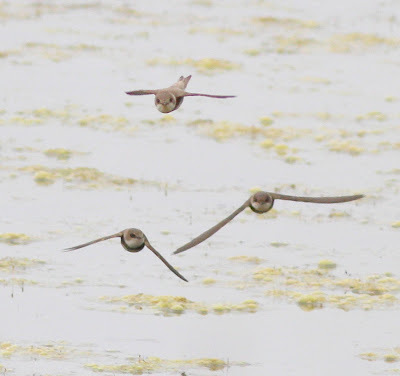 As usual they threatened to come close but stop at an invisible line on the pond and then head back to the north bank.So frustrating being unable to get shots of these little beauties.This is the best I could do. Just before I was about to leave everything on the islands took flight.I searched the sky in the wrong direction of course and was unprepared when a birder next to me shouted out "Peregrine".By the time I got onto it it was flying off towards Sidden wood and I only got a couple of crappographs in the rainy conditions. This was a shame because it had caught something for it's lunch and if I had been on the ball I could have got a decent shot.It landed in a dead tree to the left of the two storey hide near Sidden wood and stayed there for ages. A bit of a hit and miss morning. When I found out the weather man was forecasting a dry day on Monday a rare event these days I grabbed the opportunity and went over to Napton yet again.Don't worry I'm not going to load up this blog with more Napton Spotted Flycatchers shots but I'd heard that the chicks had fledged and I wanted to have a go at getting some chicks being fed shots. So how did I do then ? Slightly worse than dreadful as it turned out.The SF's and their chicks were nowhere to be found despite a long and patient search by four birders.Shouldn't moan too much this was my first failure at Napton this year. 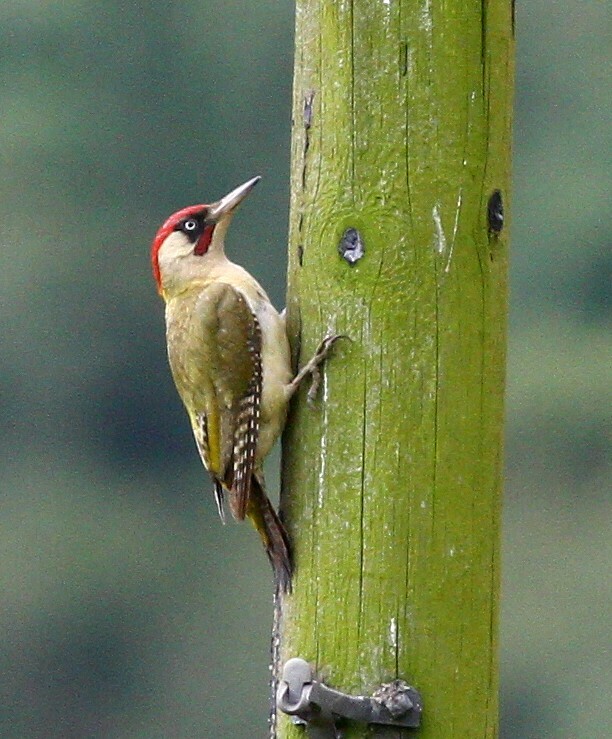 Whilst searching round the only shots I took all morning were of one of three Green Woodpeckers in the lower field.Went there for SF's and got Green Woodies.Oh Dear !!!!! After a cup of tea in the church and inspired by seeing some Green Woodpeckers I left and headed to another churchyard (Berkswell) not far from where I live which lately has been good for getting shots of Green Woodies.As soon as I entered the churchyard and was heading to where the Woodies show guess what I saw in a tree.Yes you've guessed a Spotted Flycatcher!!!! It soon flew off so I headed to see if I could see any Woodies in their usual spot.After a patient wait I'd had no luck at all so I gave up and had no choice but to turn my attention to the SF I'd seen earlier.Went to the car got my stool and set myself in the churchyard.Friends have told me that when I'm sitting on my stool in a churchyard I look like a gravestone.At first I thought this was a compliment to my field craft skills but now I'm not so sure as gravestones are usually very old,battered and covered in all sorts of crap. I did have some success with the pair of SF's but it was far more difficult getting shots of these to as they were unlike the Napton ones that used to come over to have their picture taken. 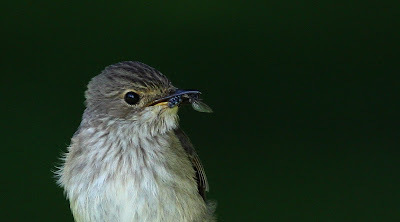 So I went out to Napton for Spotted Flycatcher shots and got Green Woodpeckers and I went to Berkswell for Green Woodpecker shots and got Spotted Flycatchers.Hey Ho !!!! Getting fed up with the Marsh Lane Black-necked Grebes. It's great to see some Black-necked Grebes at Marsh Lane my nearest local patch however despite going there 4 days on the trot and waiting patiently in the Carpark hide none of them have come anywhere close for me to get a half decent shot. The two that appear to be a pair stay right against the reeds at the North end and never venture away from this end.The third bird is a little more adventurous and will come a little closer but when it gets to a certain spot along the west bank it heads back.Very annoying!!!! 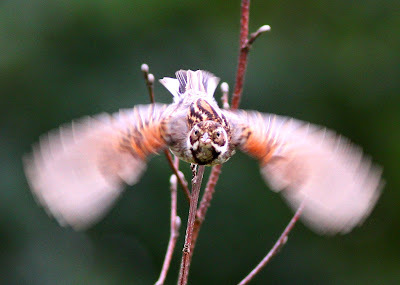 This is the sort of shot I am getting.A good example of a crappograph. To cheer me up a bit a Little Egret made a short visit. On Thursday the weather was surprisingly good so yet again I headed down south to Napton where some friends had planned to get some Spotted Flycatcher shots.I arrived a little after 10.00AM and joined some photographers one of whom had travelled a fair distance to see them having seen our shots on the internet.Although I didn't need any more shots I couldn't resist joining in. A couple of the photographers said how amazed they were with how close the birds would come and just to prove the point one of them probably needing a rest from feeding the chicks ( there are at least 3 and possibly 4 chicks) settled down on a nearby gravestone and stayed for a few minutes.Of all the gravestones in the churchyard it chose the nearest to us photographers.Here it is constantly calling out. 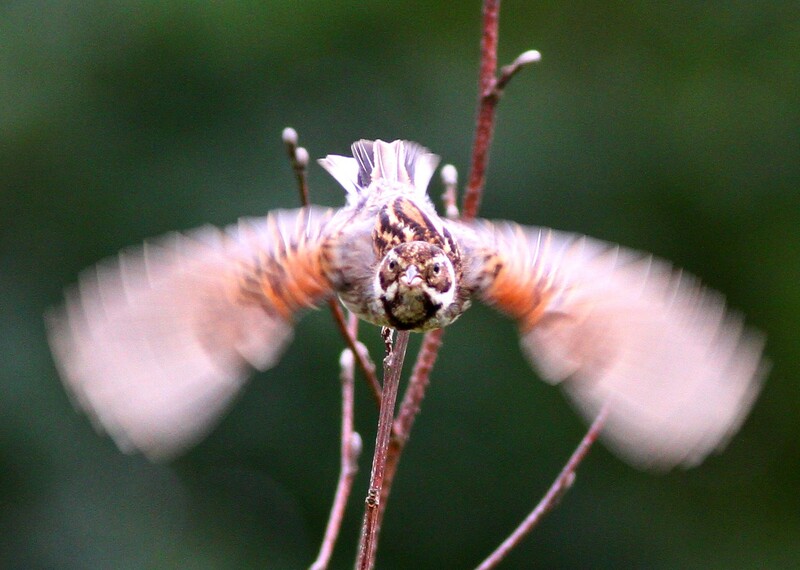 A Kestrel paid a very short visit but soon shot off.All I could get was this shot. I tried for some shots with food caught in their beaks. On the way home I called in at Marsh Lane and surprise surprise the BN Grebes were miles away from the hide.I bet at night they come down to party right in front of the hide. A bit of a hectic morning. I had not planned to go out with the camera on Sunday morning but when I was up early and for a change the weather was fine I thought I'd better get out there as rain was forecast for all of next week.Finding somewhere to go was not easy but at the moment the only show in town is at a churchyard in Napton. I already got some decent Spotted Flycatcher shots so I didn't need any more but I knew I'd meet up with some fellow photographers there and it was somewhere decent to go.Got there just before 8.00AM and was surprised to see I'd got the place to myself.I sat down on my stool in my usual spot and immediately both my little friends were showing very well coming amazingly close on occasions. Seeing these cracking birds was the good news.The bad news was the wind that was supposed to calm down was blowing strongly and it was bitterly cold and here were are at the beginning of July.All right then all I have to do is to get something warm out of the car.Unfortunately to do this you have to have intelligence and planning and all I had that morning was stupidity.I hadn't bought anything warm.What a loser!!! Three other photographers turned up not long after 8.00AM.They had come from Worcester so the Napton Spotted Flycatchers are the only show in town.One of them amused me when he said it was "warmer than this last December" but he was able to get some warm clothing from his car.They were soon getting some decent shots and I managed a couple with insects. As it was a Sunday morning it was no surprise when the church bells began to peal.However it was a surprise when they sounded so awful.I don't know if the ringer was a novice or the bells had cracked but it was grim stuff and we had to cover our ears.The SF's didn't seem to mind. By 10.30AM the SF's weren't quite so active and as I was so damn cold I decided to leave. Half way home I received a text "3 BN Grebes on CP pool at Marsh Lane".I've got some decent shots of BN Grebes but none in Summer plumage so I didn't need much persuading to make the detour to Marsh Lane.I spent well over an hour in the hide but the Grebes were not playing ball and remained far to far away for my lens and all I got were some crappographs but a nice ML tick. I'm not saying were I saw this female Ruddy Duck in case someone turns up the next day with a gun.These are very rare now.First I'd seen for ages.